Sample provided by Nerf! Opinions remain my own! NERF RIVAL PROMETHEUS MXVIII-20K Blaster (Ages 14 years & up/Approx. 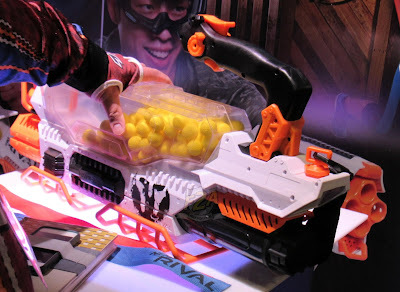 Retail Price: $199.99/Available: Fall 2018) Head into battle blazing to take on the competition with the NERF RIVAL PROMETHEUS MXVIII-20K blaster! This blaster features the new ADVANCED ACCELERATION SYSTEM which allows it to fire at a rate of 8 high-impact rounds per second! This blaster also holds a whopping 200 high-impact rounds in its easy-load hopper. The PROMETHEUS MXVIII20K blaster is fully motorized with a rechargeable NiMh battery for endless fun. Package includes blaster, 200 highimpact rounds, rechargeable NiMh battery, charger, two flags, shoulder strap and instructions. Available at most major toy retailers nationwide and on HasbroToyShop.com. Enjoy! Make sure to like and subscribe!